Hey Presto! You've landed on Andy's Magic Website. Andy is Kidderminster's best known children's entertainer who supplies fun-packed magic shows and entertainment for many schools, day nurseries and birthday parties in Kidderminster. His magic shows are packed with great comedy magic, loads of fun, laughter and audience participation for kids of all ages. 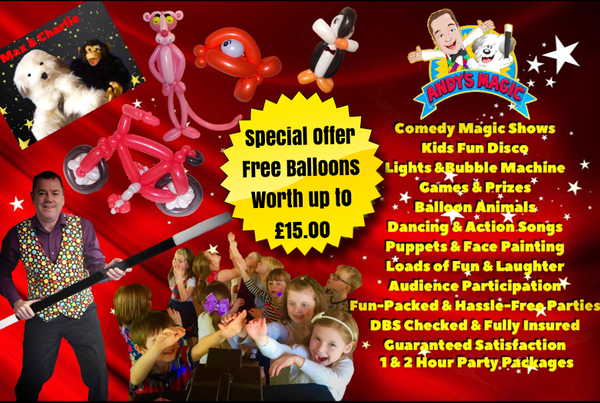 Children's entertainer, Andy's, two hour party package in very popular in Kidderminster and is a high energy, fun-packed party with up-to-date music, LED and laser lights and his bubble machine is a winner that the kids will go crazy for. He includes great party games were no one gets eliminated, meaning no tears, and with some superb prizes, like the mega popular fidget spinners, special balloon creations, sweets, gaint bubble wands and more. Andy's amazing comedy magic show, full of magic,audience participation, entertainment, fun and laughter. All the kids can receive a balloon animal too to finish.